For MCA patients Harry and Linda Morris, navigating cancer together has been a powerful reminder to keep their hearts on what matters most. They met on a blind date in Springfield, Missouri, in the early 1980s: Harry, an East Coaster from Lynn, Massachusetts, and Linda, a Midwesterner born and raised in Salina, Kansas. Both had children from a previous marriage, and neither expected a blind date set up by a mutual dentist’s receptionist to turn into a lifelong commitment. But it did. On Jan. 22, 1983, Harry and Linda Morris became husband and wife. And they’ve been inseparable ever since. Both Harry and Linda are quick to count the blessings in their lives: family, friends and their church are just the first of many they list. With such noticeably positive attitudes, it’s almost easy to miss the fighters hiding right under the surface, but after a bit of conversation, as the greater story unfolds, their determination is clear. Over the past few years, Harry and Linda have both served as caregiver and patient while facing their respective battles with cancer — and they’ve been uplifting others all along the way. It was 2010 when Harry, who retired as a corporate training and development specialist for Shelter Insurance in 2008, was diagnosed with prostate cancer following a PSA result and biopsy. His primary care physician recommended Urology Associates of Central Missouri, and eventually Dr. Michael Cupp did Harry’s prostatectomy. Harry was then placed on hormone therapy, but the cancer progressed, and Dr. Cupp recommended that he see an oncologist. That’s how he ended up at Missouri Cancer Associates. For Harry, treatment has been diversified, from hormone therapy, to radiation, to radiation infusion, to chemo, which he’s currently doing. Linda’s cancer journey has been notably different from Harry’s. It began in 2015, when Linda, who retired from State Farm Insurance in 2011, noticed a spot under a toenail that didn’t look right. Her doctor sent her to MCA, where she received a diagnosis of melanoma. Dr. Nicole Nelson of Columbia Surgical Associates performed Linda’s first surgery. Immunotherapy followed at MCA, along with additional surgeries and radiation. As most cancer patients will attest, a strong support system can be invaluable when it comes to navigating the journey from diagnosis through treatment. As both patient and caregiver, Harry and Linda have not only learned to give help but also to receive it. For both Harry and Linda, the challenge isn’t over. Harry’s treatment is ongoing with no stipulated end. Linda is getting ready for another surgery. Despite the ups and downs, Linda says they’ve learned a lot along the way. 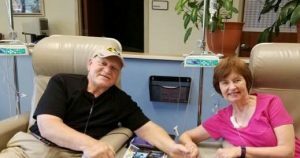 It’s that emphasis on hope and encouragement that led Harry and Linda to look for ways to help others who have been touched by cancer as well. 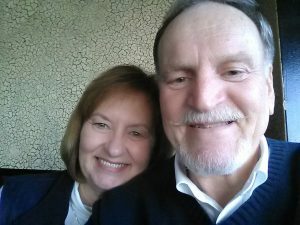 On Jan. 22, 2018, Harry and Linda will celebrate their 35th wedding anniversary. Thirty-five years of hope, 35 years of faith and 35 years of standing side by side, in sickness and in health. With ongoing treatment and plenty of unknowns ahead, they remain positive about the future. When asked what they’ve learned about each other as they’ve faced cancer together, both Harry and Linda are quick to answer. When detected early, skin cancer is highly treatable. The American Academy of Dermatology recommends that everyone check their skin regularly for suspicious spots. If you notice any irregular spots on your skin, or any changes, itching or bleeding, see your dermatologist. 1 out of 5 men in the U.S. will be diagnosed with prostate cancer. Frequent screenings can lead to early detection. 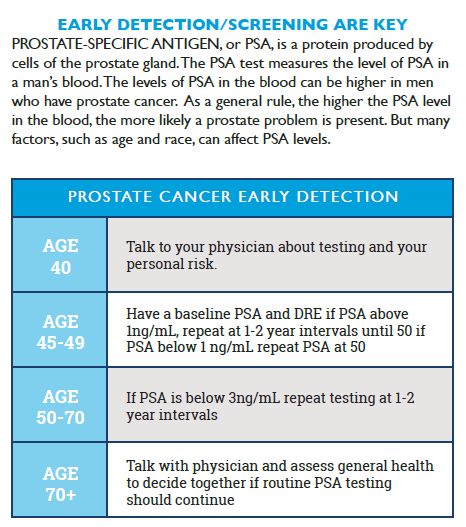 Two screening methods are available to detect prostate cancer. DRE (Digital Rectal Exam) and PSA (Prostate Specific Antigen). To schedule your screening call Urology Associates of Central Missouri at 573-499-4990.